Compiling the best and worst gadgets list this year I took note of a very sad fact: Google was on both lists. In its second year thoroughly devoted to the hardware game, Google managed to create earbuds so bad that storing them in their charging case requires a video explanation, and a laptop so fantastic I spend a lot of time on forums plotting ways to load a more useful operating system onto it. 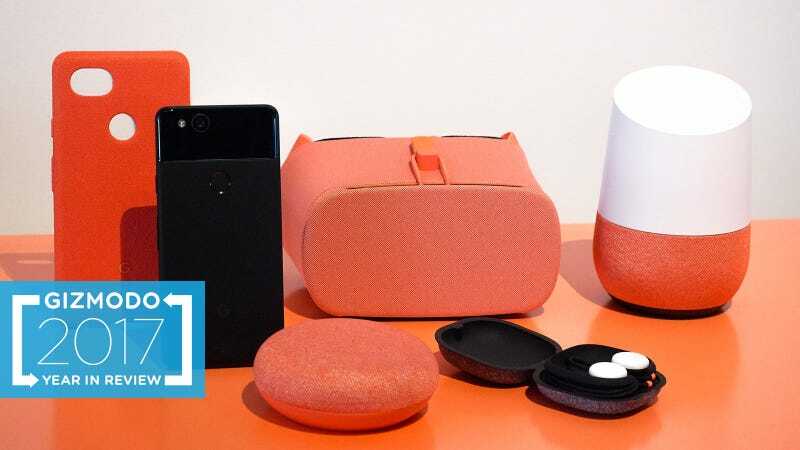 In the wide chasm between these two gadgets lies everything else Google announced this year, and together, the hardware paints a confusing picture. Google what the hell are you doing? The Pixelbook is the real outlier. Of all the devices Google released this year, it’s the one that feels really inspired. Using it I’m reminded of other remarkably forward-thinking devices, like the original iPhone or the Surface. They weren’t the first devices of their kind, but they were the first to get everything just right. The Pixelbook’s the same. It’s the first 2-in-1 that actually feels like a perfect blend of laptop and tablet. This $1000 Chromebook actually has vision! And it’s the passion and vision of the Pixelbook that highlights the completely confounding strategy Google seems to be employing for all its other hardware products. This is no clearer than with the Pixel 2. Last year Google was flying high on breathless rumors that it was building a vanilla Android phone that would be truly engineered by Google. This was a first for Google. Before the Pixel, Google’s phones (primarily intended for developers and enthusiasts) were really designed by phone companies like HTC or LG. Google would sign off on the hardware, slap the Nexus moniker on the outside, and make sure it was be first to get the latest version Android as soon as it was available. The Pixel 2 was supposed to be something more—a true rival to the technological innovations perfected by Samsung and Apple. But the Pixel never lived up to the hype. It was a fine phone, but no more spectacular than a Nexus device. For the Pixel 2, Google couldn’t just produce another Android phone. It needed to be as forward thinking as the Samsung Galaxy S8 and Apple iPhone X. Those devices set trends, and the Pixel 2 needed to do the same. Instead it was a flat refresh of the Pixel. It’s a boring phone, and the larger, and slightly more attractive Pixel 2 XL isn’t much better. The worst part is it feels like Google is totally okay with its boring smartphones. Earlier this year rumors swirled that Google was going to buy HTC, which would instantly put a really good smartphone team in its corner, but give that team the money and access Google allows. It was exciting, even if it felt positively mercenary for the company to just buy its way into smartphone success. But Google didn’t buy HTC. Instead, for $1.1 billion, it bought the team that built last year’s totally underwhelming Pixel phone (and a license for HTC’s considerable phone IPs). This wasn’t the move of an Apple and Samsung competitor, it was the move of a big company with deep pockets trying to stay afloat. It seems evident that there’s no real vision to the Pixel phone program. I used to say the handsets were examples of Google treading water until it could create the phone it really wanted to make, but it feels more like Google simply doesn’t care about being in the phone business. The same can be said of the Pixel Buds, one of our entries in the Worst Gadgets of 2017 list. In his review, my colleague Adam Clark Estes said the buds feel “like an imperfect version of what Google was really trying to do.” I agree. After the success of Apple’s completely wireless Airpods, and the ensuing glut of wireless competitors, Google needed to produce some cool wireless earbuds that would further our transformation into cyborgs. The Pixelbuds’ promise of instantly translating languages seemed to be just what the cyborg ordered. But that feature only works with the middling Pixel phones, and the Pixel Buds aren’t actually completely wireless. It, and the as yet unreleased Google Clips lifeblogging camera, feel unrefined, like some extra junk Google wanted to throw at consumers just to see what sticks. Even Google’s smart home assistants, the Home, Home Mini, and Home Max, feel more adequate than remarkable—and they need to be remarkable. Google and its smart home assistant rival, Amazon, have been mum on precisely how many units have been sold of their respective products, but that doesn’t stop people from inferring, and so far they’ve inferred that Google is trailing Amazon. 9to5Mac noted that over the long Christmas weekend, it was the Amazon Alexa app that shot to the top of the iOS app download chart—indicating a huge swath of new users. The Google Home app was also in the top ten, but well below number one. And in November the market research group Consumer Intelligence Research Partners released analysis that suggested there are over 20 million Amazon Echo devices in American homes, versus just 7 million Google Home devices. In other words, “hey Google” is losing to the more ubiquitous “Alexa.” That means that its smart home speakers need to stand out. They certainly look better than what Amazon has to offer, but in our tests, the Home Mini struggled to perform the smart tasks that Echo Dot handled with aplomb, and in the big premium speaker space the Google Home Max looks pretty, but doesn’t exactly make sense next to cheaper Alexa-powered devices like the Sonos One. Things will only get trickier next year when Apple finally releases the HomePod. That smart speaker will be the last to market, but with that Apple polish and the very familiar Siri inside, it could easily surpass Google’s more staid offerings. And this all brings me back to my original question. What the hell is Google doing? Google is a business, and it has plenty of investors who expect big profits and big successes, so it’s, you know, in the best interest of Google to produce hardware that rivals and surpasses its competitors. Google wants to make new toys, but right now, the tech giant is only going through the motions.